A few years ago I was taking my sister-in-law around Prague to see the sites. We took the tram to Hradcany (Castle hill) and after touring the St Vitus Cathedral and other castle buildings, we decided to walk over to Strahov Monastery. It has a beautiful library and other rooms with magnificent decorations from the 17th century. As we were walking, we heard a very loud commotion coming from one of the inner courtyards, which we could look into through an archway. It looked like people were rioting! I could not understand what was happening! So being courageous, we decided to investigate… and as we could see more and more of the courtyard we saw people jumping on parked cars, setting fires (! ), etc. No one was paying any attention to us so we slowly edged our way around the perimeter, and I know my heart was racing! 😳 I just couldn’t figure out why there were no police!! We sheepishly made our way out and continued with our walk! I am an opera buff, I am not ashamed to admit. I have seen operas in New York, Florida, London, Prague, Italy, and more. But not all evenings went as well as I had anticipated. My father and I were so excited to be at this gala event at the Met, where Jessye Norman was going to be performing in ‘The Makropulos Case’. We had the best seats ever – right in the center of of the orchestra. The lights dimmed, the curtain came up and there was the tenor, Richard Versalle, up on a 15 foot high ladder singing the opening aria. It was a stunning set, with giant file cabinets, etc. All of a sudden, he stopped singing, and fell backward, making no sound, and landed on the stage with an awful thud. The audience was at first very quiet, and I thought, well, maybe this part of the show? But then almost immediately the audience erupted in loud exclamations, and the curtain was quickly lowered. Sadly, Mr. Versalle had suffered a massive heart attack…. and died right there in front of us! It was unimaginable. And horrible. Of course, the performance was cancelled, and my Dad and I went to a local pub to recover and drown our sorrows! I had been so looking forward to seeing Carmen in this Roman amphitheater that was built in the 1st Century. It was a beautiful evening, and my friend and I, with my son and his friend, had great seats right on the main floor. The stage is massive, able to accommodate horses, all sorts of other animals, and a huge ensemble. It was breathtaking. But as the opera continued, I began to realize there was something wrong with the tenor’s voice. It progressively got worse, and my friend leaned over and asked, “Is this the way it is supposed to sound?” uh, no. The act ended and I assumed they would substitute an under-study. But apparently there wasn’t one! So they made an announcement over the loudspeakers (really!) asking if there were any tenors in the audience!!! And yes, incredibly enough, there was one! But instead of going on stage, he sang from the orchestra pit….and the tenor on stage LIP-SYNCED!!!! I am going to go out on a limb here and say that I witnessed the ONLY lip-synced opera in history!!! and I do not recommend it! But it made for a good laugh! PS. a friend in Washington DC was going to invite me to the Kennedy Center (he had season tickets) but after these two mishaps, he said, “Oh no! you are the Typhoid Mary of opera! I can’t let you anywhere near the Kennedy Center.” sigh. Saturday, July 5: We are anxious to cross into Mongolia and some new scenery! We arrived at the Russian border town of Naushki at around 7PM. The guards board the train and you can’t get off until they finish their inspections. But there were no vendors here any way. Which is ridiculous as the train sits here for at least 4 hours. But to continue….I gave the guard our passports and she looks at my mother’s and says “Visa problem”. Uh oh. She calls over another guard who spoke rudimentary English. Unfortunately he was also the most loutish looking one of the bunch. He tells us we have to get off the train and go into the station (which is very grand as you can see above, for such a tiny town with unpaved streets). Of course at this point I am thinking, well, we’ll bribe our way out of this. Surely they will take American dollars and let us go on our way. They sit us in the station while they go behind closed doors in an office. Once in a while someone would come out and look at us, but without saying anything. Finally the guard comes out with some others who look more in command but they don’t speak English. They do not want our money (did we meet the only honest guards in Russia? ), they will not say anything except we have to go back to Ulan Ude to get a new visa! I yelled “Ulan Ude!! That’s 6 hours from here!” Now I was starting to panic. There was a train at 1AM that was going back to Ulan Ude. In my mind I start visualizing the whole process. Getting our stuff on this horrible local train, one of us having to stay awake the whole time to guard our stuff, getting off the train and trying to find a hotel, a cab to take us to the visa office, etc. etc. By this time we had gone back on board the train to pack and basically throw everything into our suitcases, explain to our train companions what was happening (to gasps of disbelief), and got back to the station. Where we sat for another couple of hours. They would not give us back our passports until the train left the station. I said, What do you think we will do? Make a mad dash for the train? What idiots. And the train did not leave until after 1AM. Can you imagine, it sat there for over 5 hours? (nothing to do with us, apparently this is normal). Anyway as we are sitting in the station, numb with shock, a man (with gold teeth!) comes up and hands me some letters to read. I thought this was some more bureaucratic crap but read them anyway. Basically the first letter said, “If you are reading this letter, I have good news and bad news. The bad news is you have met the lowest form of humanity, the Russian border guard. The good news is the man who gave you this letter can help you” He went on to describe his situation which was similar to ours and how Vassily had helped them get their visas. The letter said that without him it would probably take us 5 or more days to get the visa. Yikes!!! Can you imagine being stuck in a dreadful Siberian town for that long? Anyway there were other letters from other stranded travelers that he had helped (and all said we could not do it alone) and so my mother and I looked at each other and said, What choice do we have? Vasily lives with his wife right down the street from the station. He has helped about 25 sets of people since the new law went into effect in March 2007 that you can’t just pay a fine at the border, you have to get a new extended visa. The stupidest law I ever heard of. My mother had said a few times as we passed these Siberian huts along the way, “I wonder what they are like inside” Well, unfortunately we were about to find out!! We arrived at a locked corrugated metal fence which his wife opened for us. There were a few freestanding huts inside the “compound”. One is under construction (financed by us unlucky tourists I imagine), there is a main house, a free standing sauna (which all Siberian houses have, and which is actually quite nice) and a few other misc buildings including the outhouse. But since it was dark we didn’t see all this until the next day. A very big garden and chicken coop completes the picture. Anyway we went in and put our luggage in our room (two beds, a small nightstand and a bare bulb hanging from the ceiling.) No running water in the house, the kitchen has a table with 4 stools, an electric hot plate with two burners and a big vat of water. How this woman cooks big meals in this I don’t know but she does. As I sit having a cup of tea, Vassily shows my mother to the toilet (she wanted to know where it was in case she had to get up in the middle of the night). I wish I had had a camera to record the look on her face as she came back and said “I can’t do this!” Total panic!! He did leave a light on outside and the two of us did walk together later that night all the way to the outhouse – with its hole cut in a wooden floor. I’ve done holes in the ground before and so has my mother (and so have many of us who travel in out of the way places) but somehow it was always for just a quick visit. When you have to use it for EVERYTHING it is indescribably horrible. Sunday, July 6: The next morning (I finally fell asleep after worrying that maybe we were in the clutches of some mad husband/wife murder duo…. Obviously, I read way too many murder mysteries!!! But seriously, no one knew where we were, and we were trusting ourselves to this total stranger!) we had a nice breakfast of fresh eggs and tea and then we drove about 30 kilometers to a photographer. Vassily had arranged this knowing that we needed 4 photos plus all this paperwork. We spent the rest of the day reading and went to bed early in order to get up at 5 the next morning to get on the road for Ulan Ude. Monday, July 7: Ulan Ude is the most awful place I have ever seen. Really. Most of the streets except for a few downtown are dirt. No sidewalks. Crumbling buildings everywhere. When I think of staying in a hotel there, I was horrified. Can you imagine what it would have been like? Not that our Siberian hut was better, but it was clean. And the people friendly. When we finally got to Ulan Ude after our 3 hour drive, we discovered that the government visa office is actually on the outskirts of the city. How the heck we would have found it on our own is a mystery to me. We got there at 9AM and because Vassily knows all these people in the visa office, we were able to get the paperwork started then, even though technically the office doesn’t open until 2P M.
Normally, the Visa office is open ONLY TWO HOURS A DAY….. except Wednesdays. When it is not open at all!!! So without Vassily we would have been there forever, not knowing all the forms to be filled out. Plus finding a photographer. And by the time you find one its too late to go back as the office is closed. I can see where this process could take over a week. And in order to pay the visa fee you have to find a bank that has a government account to pay into. The whole process is absolutely ridiculous. I think someone should tell them that the Communists are gone. Anyway, luckily we did get the visa at around 4 PM (the amount of paperwork to be filled out is quite amazing). And rushed back (over pot-holed roads) to catch the 10PM train for Mongolia. This is just an overnight trip but luckily the train has compartments – a little different than our original train but quite comfortable and air conditioned! Of course the air conditioning is turned off while you sit sweltering at the station but at least it is nice when it’s moving. Woke up to beautiful rolling terrain of Mongolia with its yurts and horses and pretty little houses. So happy to be out of Russia!!!! Tuesday, July 8: We decided to fly to China since we had lost so much time in Siberia. We flew from the Genghis Khan Airport (!) in Ulan Bator on Air China to Beijing. I was so anxious to get to China that I was willing to fly Air Mongolia if we had missed the Air China flight! (I had asked my husband to check online for flights out of Ulan Bator to Beijing. He called back and told us about the Air China flight. And said there was an Air Mongolian flight later that day but you can’t buy tickets for that on Expedia! ha ha Really?) By the way, the Genghis Khan Airport is very modern and has a great coffee shop and souvenir shop. I was so happy to be back in civilization!! China was great. Of course they also use holes in the floor as toilets (porcelain, self-flushing!) even in nice restaurants (tip: use the handicap stall, they are regular toilets!). We stayed at Raffles hotel and boy was it fabulous. When we arrived they sat us down at a small round table in the lobby (no check-in counters here!) and served us an iced fruit drink. And there we were, dirty, sweaty, exhausted and hobbling. All I wanted was to get to the room and here this manager was being so pleasant, explaining everything. The minute we got to the room we had our bath/shower and sent all our clothes to the laundry! And ordered room service!! AAAHHHH! I had an infected toe (from a stupid blister!) which was so bad I could barely walk. And my mother also was limping around since her foot was killing her. (turned out she had a dislocated toe which we did not discover until she got to Florida!) So we were really two basket cases. But still enjoyed China, and realized it was a great time to visit right before the 2008 Summer Olympics. Everything looked beautiful, people were very friendly. The city is huge but the buildings are really fabulous – very creative. It is a super modern city but right in the center is the Forbidden City. We saw everything, including the Great Wall. We got there late with our guide and all the crowds had gone. So we had the wall to ourselves. What an experience! In 2008, my mother was leaving Prague after living there for 18 years and was moving back to the US. As a farewell trip, she and I decided to take the Trans Siberian railroad across Russia. We have talked about it for years and decided it was now or never. Monday, June 30: Direct flight from Prague to Moscow, but still they lost my big duffel bag! (I should have realized this was an omen of things to come.) Off came all the suitcases except the one that I have been packing and adding things to for the train for months!! I was beside myself as you can imagine!! The guy at the Lost Luggage counter, said “why are you so upset? Haven’t you ever lost your luggage before?” I almost hit him! I said, “yes but I am getting on a train for 6 days tomorrow and this bag has all the stuff I need” He assured me the bag would arrive later that day, but still I kept going over all the things I could replace and all the stuff I couldn’t if the bag didn’t come. (Food, books, scrabble, pillows/blankets, CD player, cleaning supplies, etc.) But luckily around midnight it was delivered! Tuesday, July 1: Sightseeing in Moscow. Not impressed. The only thing of any interest is Red Square. The rest of the city is drab, architecture wise. Only the old buildings that are still standing from the Czarist days are of any interest. And they do have beautiful parks and flower displays everywhere. On Tuesday we were on our own and realized we could not get anywhere without a taxi. Everything is ONLY in Russian (Cyrillic) – nothing is written in anything we could even decipher. Unfortunately we could find no one who spoke any English – not even the young people do. And they are not very friendly. Finally found a receptionist in the lobby of a business center who spoke enough English to understand what we wanted and she called for a taxi for us. Woman driver came! (Unusual in Europe) Took us to Red Square which was really fascinating. Saw Lenin in his tomb and St. Basil’s Cathedral with its famous onion domes. Also the GIANT G.U.M. store which used to be one gigantic state store but is now more of a mall with hundreds of luxury shops, even an Apple Store. Went into a gourmet food store which was selling those small boxes of California raspberries for $15!! Red Square is smaller than it appears in pictures but is still quite impressive. Tuesday: July 1 9PM: Boarded the train (Trans-Mongolian Train #4)!! The Trans-Siberian #2 to Vladivostok was boarding on the track next to ours. It is a prettier train (blue and white) while ours is green. However we had very nice Chinese attendants who were friendly and very helpful. Don’t speak much English but usually a smile and pointing got the message across! Our compartment was just what I expected – two berths on one side, a seat on the other and a table by the window. It is carpeted and has a fan! (weather was actually pretty nice along the way so it didn’t get too hot) We shared a “shower room” with the compartment next door (occupied by a smelly old man who wore Depends!! really, I am not lying. He stayed in his room almost all the time and when the door opened, Wow! the smell was horrible! After he came out of the “shower” I would go in and spray perfume! (One thing missing that we didn’t bring was Lysol spray – I had Lysol wipes which I used every day in there and in the toilet). Anyway in the shower room is a sink and a spray hose (which didn’t work very well) and a drain in the floor. You can hang your clothes on a peg and close the waterproof doors to keep them dry. Then you pour the boiling water from a big thermos (filled from the samovar at the end of the compartment -the attendant does this for you) and mix it with the cold tap water (I stole the sink stopper from the toilet sink!) Then pour it over yourself!! That’s the shower. The toilet is at the other end of the compartment and sometimes there was toilet paper and soap and sometimes not. So luckily we had our own. I used my Lysol wipes a lot! Took me a few tries to get up on the upper berth! But once I got the hang of it, it was easy (as our friend Ryan, a Navy man, told me it would be!) Glad we had brought our own lightweight comforters (all they had were heavy WOOL blankets!) and pillows. I am so glad we had the instant coffee (International Viennese Coffee) for the morning. With hot water always available, we made our soup and oatmeal and coffee whenever we wanted. We also had packets of cheese and crackers, peanut butter, trail mix. There was a dining car 5 cars down from us which we made it to once (!) and had an omelet which wasn’t bad. But we actually had more than enough food – supplemented by bottled water and bread bought from vendors on the platforms. My mother kept hoping for homemade food from these vendors but that didn’t happen until we were way far East. Until then all they sold were chips and sodas and other packaged snacks. Anyway the first night we both slept like logs! The movement of the train is very soothing – I was totally not prepared for this, as I worried beforehand if we’d be able to sleep with the noise of the wheels, etc. But everyone we met had the same experience, and in fact we all took naps during the day as the movement of the train would make us feel sleepy! Saturday at dawn: Reached Irkutsk at 5AM. If you’ve ever played the board game Risk you can appreciate how exciting it was to be in this city. Once we left the lake, we traveled about another 3 hours to the Siberian “city” of Ulan Ude. No vendors on the platform which made all of us passengers really mad. The city is very big – spreads out forever it seems. In about 5 hours we would reach the Russian/Mongolian border. Where all our troubles will begin. July 1994 we traveled by car through Switzerland. What an experience! From Zurich to Lucerne to Interlaken over to Montreux and Vevey and Lausanne and Geneva, it was quite a wonderful drive. Cheese and wine and chalets and Alps: what’s not to love? We bought fruit and olive oil at farmer’s markets, sampled cheese at dairy farms, toured vineyards, and so much more. One of our later stops was Reichenbach Falls. I imagined Sherlock Holmes and Moriarty fighting it out at the top! There is a very steep funicular that runs to the top of the spectacular falls. I had my eyes closed the whole way! The falls are a short distance from Meiringen, the town that claims to be place where meringue was invented. Anyway, after Geneva, we swung back around Lac Leman and went southeast to Zermatt. You have to park your car in the small town of Tasch and take a train, the Glacier Express, into car-free Zermatt. Jim fell in love with the town, it is so charming and surrounded by the Alps, every view is spectacular! 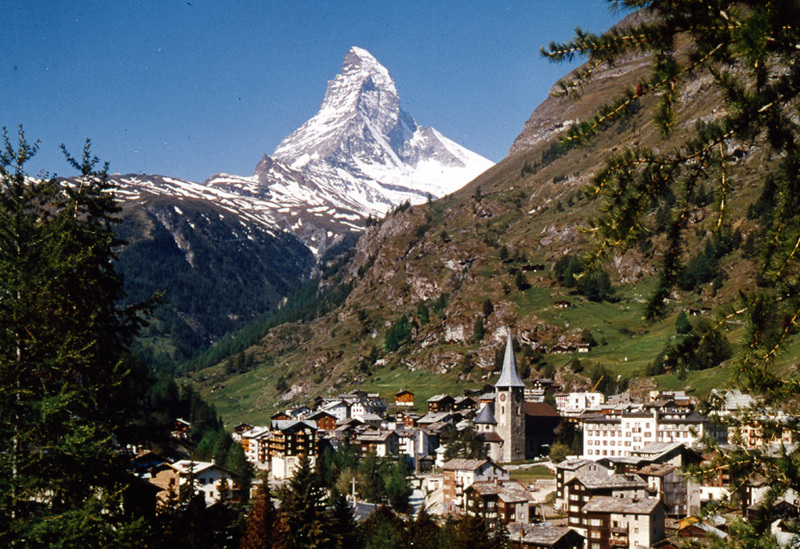 The town is dominated by the Matterhorn, with its distinctive peak able to seen from everywhere in the town. We arrived at our chalet-style hotel, got settled in our room with its balcony overlooking the town, and went out exploring. Early the next morning, sitting on the balcony, Jim calls his brother Tim back in Arizona. He said, “Just wanted to call and tell you I am sitting here, looking at the Matterhorn”. What did Tim say? …………… “I didn’t know you were going to Euro Disney” !!!??? We’ve been chuckling over that one for years! Back in the days before the internet (gasp!) we had to call the airlines to make reservations. My mother would sit for hours in the middle of the night, when you were guaranteed to get an agent to help, and ask about deals! In 1967 she found quite a bargain – you could fly to anywhere in the Caribbean for $100 (including some South American countries) as long as between each leg you went back to Puerto Rico. Really! So we flew to PR, then to Trinidad, then back to Puerto Rico, etc. Other stops were Venezuela and Haiti. There had just been a big earthquake in Caracas the month before, and we were taken on a tour of the quake damaged buildings – quite a sight – one of the hotels on the beach was now twisted into an S shape! But anyway, my sister, Wendy, and I were sunbathing by the pool in Caracas and for some reason the sun really affected me. I’d sunbathed all my life and never had a problem, but I guess the sun was stronger than I was used to, and I started to feel faint. I mentioned this to Wendy, and she helped me into the hotel where I promptly fainted. The hotel doctor diagnosed sun poisoning. such fun. I ran a fever for days, through our flight back to Puerto Rico and on to Haiti. At this point I had chills and my skin was started to blister and peel, even my lips! yes, my father did joke about that. There is no way to describe the self-pity of being left alone in a hotel room in Port au Prince, high in the hills, delirious with fever, while the rest of the family goes sight-seeing. ….And realizing that you are hearing voodoo drums beating in the jungle above the hotel. Yes, voodoo drums. At first I thought it was some music coming from the pool, but no. Did I think I was hallucinating? you bet. But no. My mother tried to arrange a visit to a local voodoo ceremony, but I must admit I was relieved when that didn’t pan out. After I started to feel better, Wendy and I mingled with local teenagers and went dancing, learning calypso. And also ice-skating (a very popular activity in the heat of the summer)! 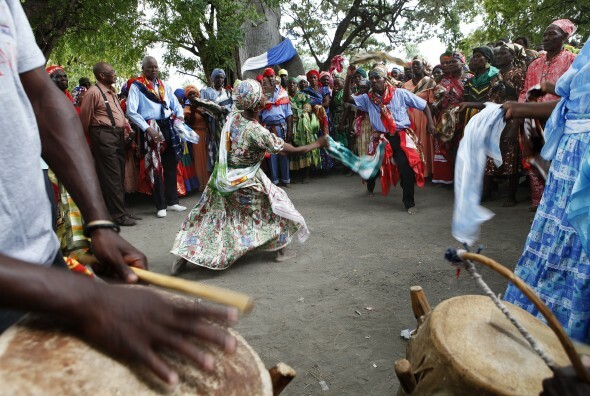 My memories of Haiti are a kaleidoscope of images – disjointed but strangely beautiful, all with the overlying beat of those drums! My mother and I were on a plane in July 1969 flying to Morocco from Madrid. And everything was going along fine, ride was smooth. All of a sudden the pilot comes on the intercom, and starts counting down. Pilot comes back on: “Congratulations to all the Americans on board, the rocket just took off from Kennedy Space Center for the moon!” And all the passengers started clapping. For goodness sakes, couldn’t he have said something first?? So I took my teenage (13 or so) son and his friend on a Carnival cruise to the Bahamas. Figured it was a great way for me to relax and not have to worry what they were up to. How much trouble could they get into on a boat? OK, dumb question. But they had their own cabin, and there were tons of activities for them on board. 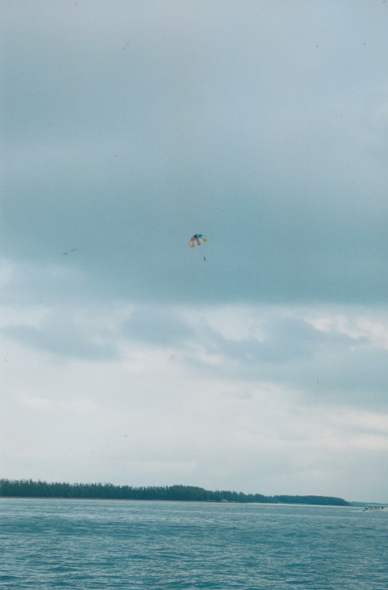 Anyway, one day I decided to take them parasailing. My son, Andrew, was not thrilled as he is not adventurous by nature, but if his friend was going, by god he was not going to be left out. So we motorboat out to this big platform in the middle of the sea. First Alfred goes, up up and away! He has a great time. I am not sure what the laws were at that time, but I don’t believe there was much regulation regarding parasailing. I’ve since read that the height limit in the US is 500 ft. I know these people were going much higher than that. A rather heavy-set woman went next and she was not pulled up in time — she ran across the platform and splash! she is in the water before the sail filled and she is pulled up! Oooh embarrassing! Next is Andrew’s turn. He is being pulled across the platform, his eyes big as saucers, and looking like he’d rather be anywhere else. But up he goes! and goes. and goes. and goes. OMG – he is so high, he is a speck!! truly, a speck in the sky. Alfred and I were hysterically laughing. I know, I know. No sympathy here from the mother. But, anyway, what could I do? Finally, down he comes. He is grumpy. And he is wet! His shirt and hair soaking wet. I asked him how that happened, and he said very indignantly, “Well, I was in a rain cloud”!! Lucky I did not fall off the platform laughing. Yes, he was so high even though it was sunny down below, it was raining up above. (disclaimer:  I had no idea that parasailing could be dangerous. Did not learn that until long after this trip.